How do giants, map-making, and space tie together? Wisdom, classification, and cooking? The reconstruction of Jerusalem and the Industrial Revolution? These are just some of the topics covered in The Weaver Curriculum® Volume 4. If you had to teach about these topics, how would you integrate them, or transition from one topic to the next? For the answer, read on! Finding common ground in different topics can be challenging. Weaver accomplishes this task by basing all its studies on the Bible. Although it's possible to teach from a Weaver Volume without pre-planning, you'll find your day goes smoother when you plan ahead. Save time and let Weaver do the lesson planning for you! The Weaver Day by Day isn't a boring schedule of when to teach the various objectives within the corresponding Volume. Each day offers a "Thought for Today" to encourage you, a list of resources, creative writing prompts, and space to record math and phonics/reading assignments. Whether you use it to teach from, or as a guide to plan your own lessons, you'll benefit from the Day by Day lesson plan book. Completely structured, yet completely flexible. The result? Lesson plans that complement your Weaver studies! Why reinvent the wheel? 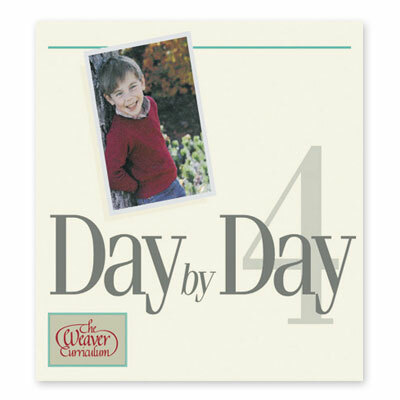 Order your copy of Weaver Day by Day, Volume 4, from Alpha Omega Publications today.